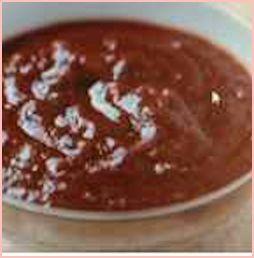 This barbecue sauce recipe brings back happy memories for me. My parents and I used to have barbecues in the summer - great times when we'd laugh and talk. My dad died in May 2005 and I miss him like mad - but I have such fond memories of him - he was a wonderful man - just a great bloke. He was so interested in my website - logged on every day to see what I'd done. My mum came to live with me in 2014 and we still have barbecues but sit and reminisce. Heat the oil in a pan and fry the onion and garlic until softened. Add the puree, worcester sauce, sugar, lemon juice and wine and simmer for about 10 minutes until the sauce is thick. You can use this sauce to marinade your seafood if you like (you will need to let it cool though) or just baste your food as it cooks. It works equally well with meat. When we had barbecues, we would have a mixture of meat and fish. 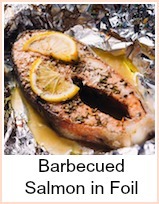 I would brush the fish/meat with the sauce as I turned it and then the remainder was served with the barbecue so that people could put some on their plates - it is particularly good over new potatoes. 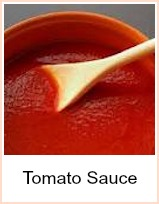 The perfect barbecue sauce. 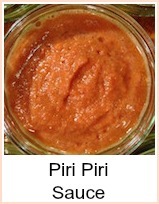 I found this recipe about thirty years ago and it is great with fish, shellfish, meat and vegetables. It's the highlight of my barbecue every time.